These vacuum spheres housed wind tunnels that were part of Langley's Hypersonic Facilities Complex. What looks like some otherworldly scene from a sci-fi movie is just some vacuum spheres used to simulate hypersonic flight conditions in attached tunnels. 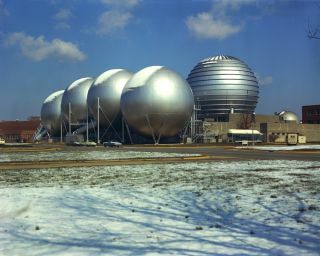 In this historical photo from the U.S. space agency, the vacuum spheres, now part of Langley's Hypersonic Facilities Complex, had been dusted by a light fall of snow in 1969. Here’s how it worked: The spheres would be evacuated to give low starting pressure in the adjacent eight hypersonic wind tunnels, simulating a range of conditions from six to twenty times the speed of sound. The various tunnels utilized air and certain gasses, including helium and nitrogen, to investigate aerodynamic and aerothermodynamic problems in flights above the speed range of Mach 5, or five times the speed of sound.